Rotherham are working on a new contract for Ryan Williams, with discussions with his agent underway. The 25-year-old is out of contract in the summer, but having impressed since his 2017 summer arrival, the Millers are keen to tie him down. 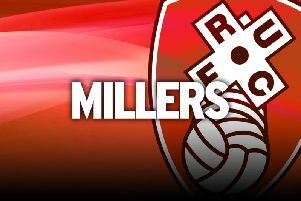 Williams himself is open to extending his AESSEAL New York Stadium stay, but for now is happy to leave that to his representatives. "There has been some kind of talks between my agent and my club," Williams said. "I am happy here. I am playing at a really good level, playing well in a team that is suited to me and for a manger who suits me. "The rest of the contract stuff is to do with my agent and the club." Williams' form for the Millers over the last 18 months has put him on the verge of international recognition, having been the preliminary squad for Australia's Asian Cup squad. He has made the step up to the Championship with aplomb this season and puts his impressive form down to his relationship with boss Paul Warne. "Player-management is probably the gaffer's strongest point, but he offers a lot of other stuff," Williams said. "He has just kind of let me do what I need to do to go out and perform. I have a good relationship with him. "If he has a problem or I have a problem on or off the pitch, I just go and speak to him and he sorts it out and brings it all back down to earth. "He has been massive for me, especially after coming from Barnsley where I had a period of being out injured. "He has given me a platform, he has let me get on with it and let me do what I am good at." The Millers will need Williams to be at his best for the second half of the season as they try and keep their heads above water at the bottom of the table. They could go a long way to helping themselves by beating rock-bottom Ipswich on Saturday, though the Portman Road club are going for it in the January transfer window. The Millers will travel to Suffolk without Joe Newell and Jamie Proctor due to injuries. However, Richie Towell is back from suspension and Kyle Vassell is fit again after a six-week lay-off.